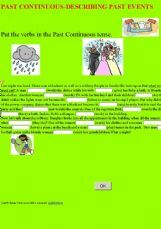 Students complete the sentences with the PAST CONTINUOUS. Hope it`s useful! 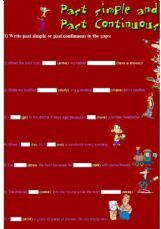 Past Continuous - Affirmative, negative and interrogative sentences. 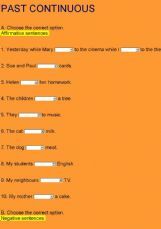 Simple Past / Past Continuous - Completing sentences with the correct form of the verbs in brackets. 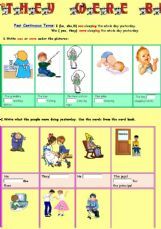 An easy activity to practise The Past Continuous tense while reading a news story that describes past events. 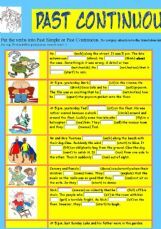 Short exercise on Simple Past or Past Continuous verb tense with examples. Past Continuous in different exercises, cute animated pictures and YouTube song.